Most of our guests have never been dog sledding before, so we strive to make sure your expectations and the experience are compatible. Take the time to really look over our website and Facebook page- we've posted lots of videos and pictures to try and share the experience. 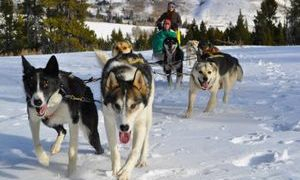 Our name is Yellowstone Dog Sled Adventures- and that is what we offer- Adventures! 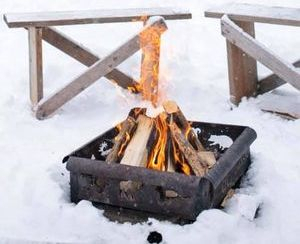 Our trips are much more than just dog sled rides. We provide an interactive Wilderness experience. You will have the opportunity to interact with hardworking huskies, explore remote wild places during winter, and get to see some of the most incredible views on earth. However, always keep in mind we are in wild places and working with animals- not touring around in a vehicle, being flexible and good-natured is an asset in these situations! Yellowstone Dog Sled Adventures is a small, family owned business that offers unique wilderness experiences in the mountains of Montana during the winter months from Dec to April. We operate adjacent to the Gallatin National Forest near Big Sky and West Yellowstone, Montana. Normally there are anywhere from 2 to 8 guests on a trip. In the Holiday Season, we take up to 14 people per trip. As mentioned in other parts of our website, we have Alaskan Husky sled dogs. Our dogs are high performing endurance athletes, bred to perform in the Rocky Mountains- not the Arctic. So, expect to see dogs with light coats (not whooly) and slender bodies sculpted for running great distances. They are supposed to be lean, and muscled up in the same manner a human marathon runner is. Most people think they are small- but, then they are blown away by how well they do the job....and by how much they love it. Depending on the group size the day of your tour, the hook-up can either be quick and easy or epic and chaotic. We run teams ranging from 6 dogs to 12 dogs, and if its a large group- we might hook up as many as 5 sleds and 50 dogs at one time! There is no way around this being a production, we strive to make it as quick and efficient as possible- but handling that many dogs can sometimes be a real chore. So, be prepared for some standing around at the beginning while we get everything ready to go, if its real cold- waiting in our heated tent for a few extra minutes is a great idea, groups with young children should take extra care to keep the kids warm and dry (out of the snow) during this time- so they don't get chilled before going on the tour. Feel free to take photos, watch, and even offer to help, but the main thing is just be patient- it will seem chaotic and overwhelming at first, as the dogs bark, howl, lunge, jump and basically just act crazy... but once we take off and are on the trail the dogs and the experience really changes. While running the dogs are silent! The only sounds are the wind, the swooshing sounds of the snow sliding under the runners and the breathing of the dogs. Traveling into the winter wilderness by dog team is an incredible experience, of course, ask questions and talk, but make sure to savor the silence for a few moments. The views are unreal- a true winter wonderland! Any time you want to take a picture, ask the guide to stop. We want you to take lots of pictures! However, stick close by the sleds, as the dogs get restless and want to run, so side hikes aren't really possible. Look for wildlife! We are in one of the wildest places in the USA, wild animals are all around. Although we may not see them a few feet in front of us, we often see them on hillsides and in meadows in the distance as we silently go down the trail. Feel free to bring snacks, but make sure they are easy to access and easy to eat while moving. Back at Basecamp: Feel free to pet the dogs, and take pictures and basically just enjoy the area and the moment. After the tours the dogs are mellow and love attention- pet them, hug them, praise them- they deserve it!